Oh man guys, the day two post-race delayed onset muscle soreness is the worst. I rolled out of bed this morning and nearly fell over. My quads, IT bands and calves pretty much hate me. But, they hate me because I had an unexpectedly awesome race in Baltimore over the weekend. I don't know where this time came from. 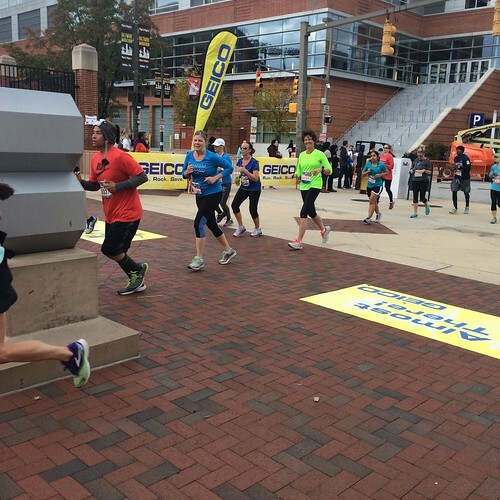 Baltimore is an extremely hilly course, and I didn't come into the race trained to run this hard. My plan all along had been to train to run the race for fun because with grad school demands this semester, I knew I wasn't going to have the time to dedicate to super long midweek workouts. Even though my plan was to just go out and have fun, I still was extremely nervous on race morning. The weather was crisp, but the sun was shining and I was having a hard time deciding what to wear. I eventually opted for my long-sleeve top since it was supposed to be breezy. I spent much of the first 3 miles regretting that decision since I was basically melting. But luckily for me, somewhere during the race it actually go colder, and I was glad to have the long-sleeves. Since I've run this race so many times now, I'm really familiar with the course and know when to expect long uphill slogs. In my head, I had a plan to run the first three miles and reassess how I was feeling when I got to the first aid station after the marathon and half-marathon courses merge right around that point. I was feeling surprisingly good and just kept trucking along, almost laughing to myself at the times I was seeing on my Garmin. Somewhere in this section of the course, I spotted a friend I used to work with at the newspaper at UMD. Thanks for being out there cheering Scott! It's always fun to see random people along the course! My next major mental milestone was to get to Lake Montebello, which was somewhere near the 7 mile mark. I knew once I got here, I'd have at least a mile of flat running as a reprieve from the hills. Until then, my plan was to keep my feet moving. Slow and steady on the uphills and then use the downhills to make up some time lost on the climbs. I tried hard not to lose time through the aid stations, though there were times when I did stop to walk for a few seconds to ensure the Gatorade went in my mouth and not down the front of my shirt. Overall, the stations were supremely well-organized and I never got stuck in a back log. I threw back my first Gu somewhere near mile 4.75. When we finally reached the lake, I was so excited to have some flat course, but maybe my legs appreciated the variety of inclines because about half way around the lake my left knee and hip started majorly revolting. I had to slow down a bit to try to get things under control, and mentally bribed myself to keep running until the next aid station, which was just around the bend. I made it, and the quick walk I took there made a world of difference, and my knee and hip settled down and didn't really bother me the rest of the race. The climb from mile 8 to 9 is pretty aggressive, but I just kept trucking on. I knocked back my last Gu just past mile 9. The last four miles of the race are some of my favorite because there are tons and tons of spectators out and about blasting music, dancing in the streets in costumes, handing out gummy bears and lots and lots of Natty Boh. Every time I looked down at my Garmin, I couldn't believe there was a chance I could still go sub-two. I thought the hills on the course would basically destroy me, but I was feeling good. Mile 10 is almost all downhill, so I knew I could make up some time there too, and I just let myself coast. But maybe I coasted a little too hard because when I hit more uphills in mile 11 I was struggling. I knew sub-two was still do-able, but I needed to keep a strong pace, and I was fading fast. Knowing that mile 12 was also all mainly downhill, I figured I'd be OK, but mile 11 just killed me. When I hit mile 12, I tried to accelerate a tiny bit to take advantage of the downhills, but I just couldn't quite pick up the pace enough. As I was cruising past Camden Yards, I knew it would be close. I kicked hard to the finish line, but probably didn't start my kick soon enough. But I left everything I had out on that course. For coming into a race with truly just the bare minimum of training, I'm honestly shocked I was able to pull off such a fast time. Sure it would have been awesome to go sub-two on an extremely tough course, but even though I didn't, I'm still thrilled with my time. I'm also really proud of how mentally tough I stayed during this race. There were plenty of times when things were sore or my legs were tired or I was staring up at another hill and I could have thrown in the towel, but I never did, and that's a minor victory too because that's not always easy for me. 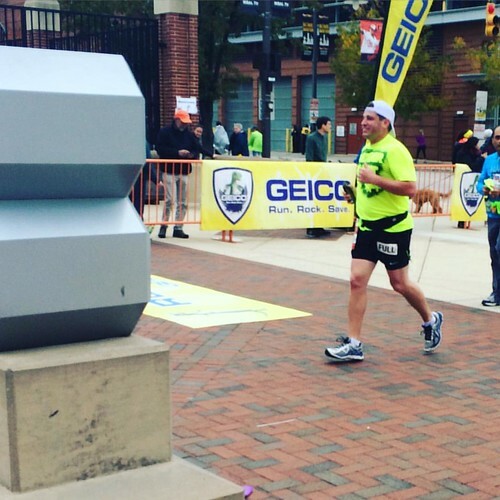 Once I crossed the finish line, I hobbled over to get my medal, and heard someone call my name. It was one of my blog readers who recognized me in the crowd. 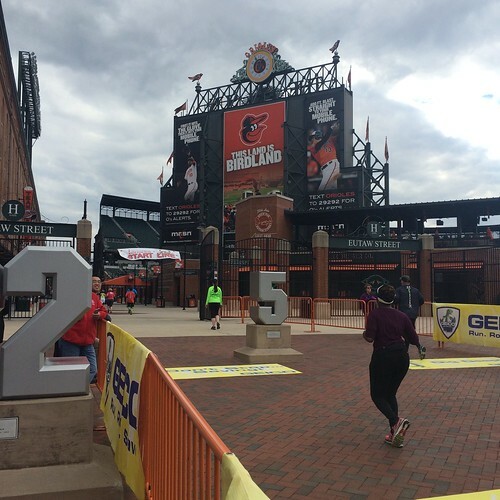 He had also finished the half and was using it as an easy run before tackling the Marine Corps Marathon this weekend! Hope you're recovering better than I am and that you have a great race next week! 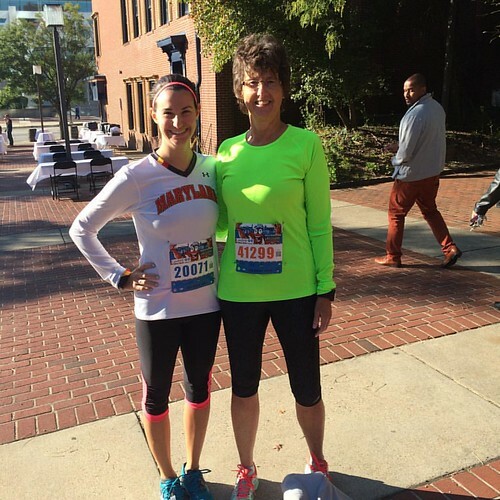 I made the long and slow hobble back to where my dad was spectating, and we waited together for my mom to finish. I'm glad she wore neon so she was easy to spot in the crowd! I also saw another one of my college newspaper friends finish his very first marathon! Congrats Jeff! You rock! Overall it was a great day of racing. I had a great time as always. 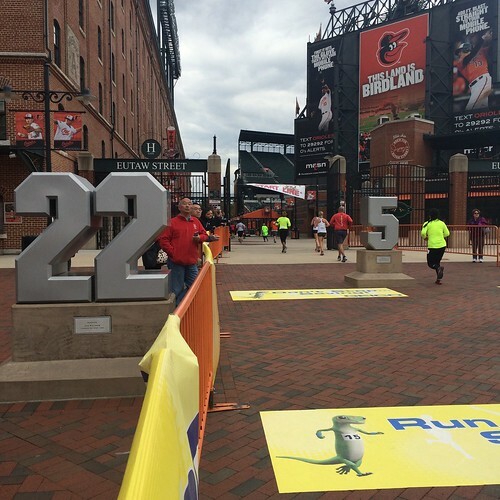 I can't recommend the Baltimore Running Festival enough. It was my first marathon back in 2006 and I've come back again and again to do the half because this city just puts on an amazing race. 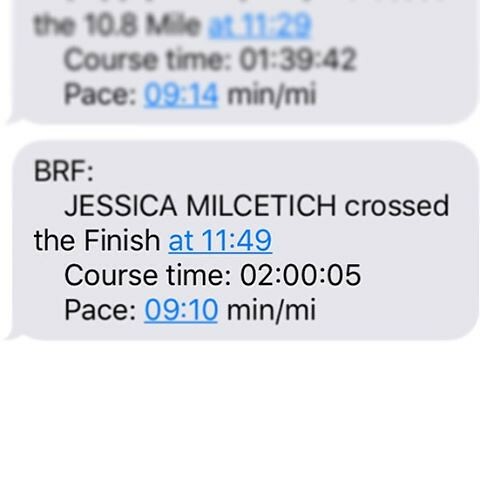 Great job Jess! I just finished two back to back half marathons and now have 12 days until I race RNR Savannah!! That's a great time and race recap! It was freezing pre-race!